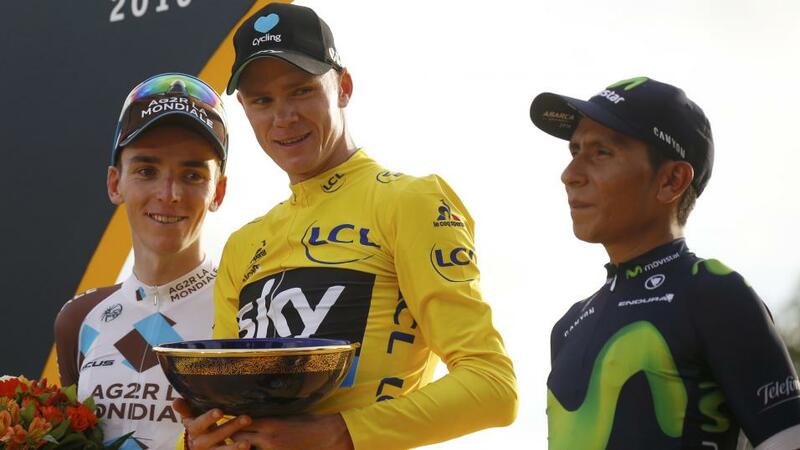 "Geraint Thomas successfully negotiated stage 18, so it's one down, two to go. He's been imperious in the race so far and will be a deserving winner, but this stage will terrify him. It's long and arduous: if he has any lingering doubts about his three-week staying power, he'll know that this stage will find him out..."
A monster. Over 200km for starters, which would be long for a flat stage, and is positively immoral for this mountain stage. In that 200km there are seven categorised climbs, and numerous other lumps and bumps. Were the Tour de France to feature on This is Your Life, then all of these Pyrenean ascents - the Aspin, Tourmalet, Soulor and Aubisque - would be brought on as special guests and asked, by Eamonn Andrews, to recount the role they've played in the life of the race, which is notable in every case. The finish is a steep 20km descent off the final climb of the super-category Aubisque. Dan Martin is heading most lists at around [9.00] but, whilst he's been on the attack in recent days and is clearly in good form, it's worth remembering that his best performances have tended to come on shorter, more explosive efforts. Added to that, he seemed to throw everything into an ultimately failed attempt to close down Nairo Quintana on Stage 17, and whether he's fully recovered form that remains a question. I won't be taking such short odds. Julian Alaphilippe [13.00] is also prominent in the market, and as the most ubiquitous rider in this year's Tour, it's no surprise that he is expected to have another tilt at a stage victory here. In reality, though, the King of the Mountains competition is won for Alaphilippe, he showed on Stage 17 that fatigue was setting in, and whilst he's been brilliant on the ascents (and descents) in this year's Tour, this stage is a very different animal. It's hard to see him featuring. In short, neither of the two favourites look like good value. This stage might be case of looking through the General Classification to identify those big climbers who, first, can handle a day of this nature; and second, are far enough out of contention to be given the freedom to target a stage win. Well, Nairo Quintana ([21.00]) and Chris Froome ([26.00]) qualify on the first criteria, but not the second. So, if they go for a stage victory, it will have to be a long-range attack, and it could possibly obliterate the standings in the race for the Yellow Jersey if it happened. Both have the capability when at their best (Quintana did it on Stage 17, and Froome on Stage 19 at the Giro), but Quintana has already exerted himself in recent days, and Froome has pledged his loyal service to Thomas. There is a nostalgic part of me that hopes for an early Quintana attack, countered by Froome, which sees Thomas crumble as the three weeks finally catch up with him, but nostalgia is not good mood music for sensible punting. Qualifying on both counts are Adam Yates ([18.00]), Romain Bardet ([22.00]), Bob Jungels ([100.00]) and Rafal Majka ([15.00]). They've all had indifferent races so far and will be looking to rescue some glory in the closing days. Of these, Bardet is probably the best value. He may have capitulated on Stage 17, but that was an explosive stage, and not the relentless test of endurance that this represents. Bardet will be suited by this. I'll split my stake between Quintana and Bardet. That way I get a bit of nostalgia, and a bit of realism. Geraint Thomas successfully negotiated stage 18, so it's one down, two to go. He's been imperious in the race so far and will be a deserving winner, but this stage will terrify him. It's long and arduous: if he has any lingering doubts about his three-week staying power, he'll know that this stage will find him out. He can ride defensively, though. He can afford for most riders to take time on him and still be confident of beating them in the time trial to come. As long as he doesn't lose significant time to Tom Dumoulin and Primoz Roglic, he's safe. And, presumably, Team Sky - with Chris Froome acting as super-domestique - will set a gruelling-but-even pace on the front, meaning that Dumoulin and Roglic are neutralised. The likes of Quintana and Bardet can attack all they want, but Thomas can afford to let them go and ride a tempo on the front. They would need to take more than five minutes to represent any genuine danger to his title aspirations.